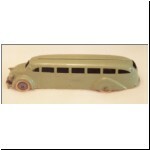 Last month we got through the 1937 debut of the Greyhound Bus. 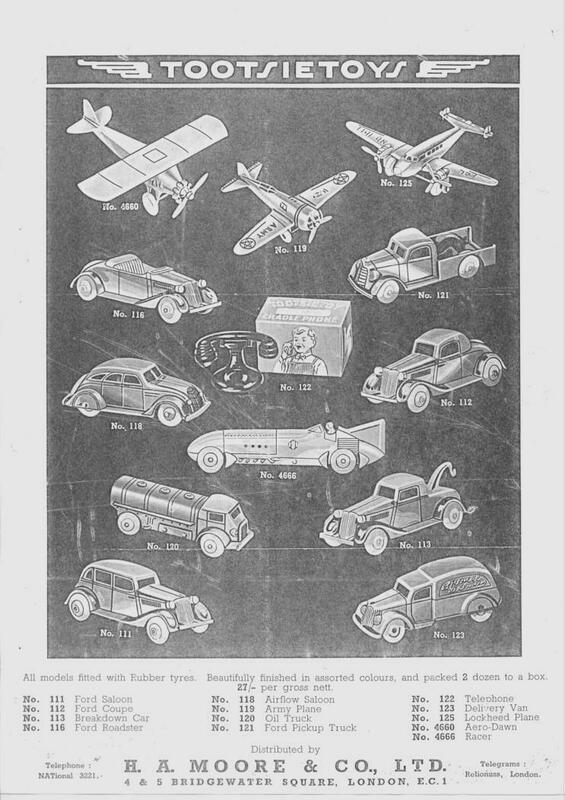 This month we can wrap up the remaining pre-war production and recap a bit. 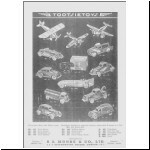 This black and white fold-out six page leaflet is undated but appears to be from 1938. 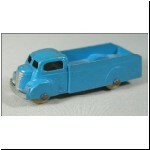 This is a UK edition, having the name and address of the UK importer H.A.Moore & Co.Ltd. 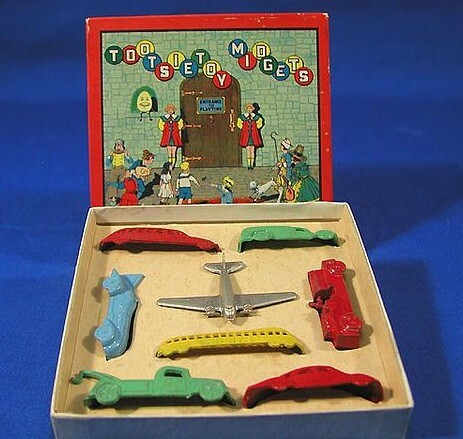 and trade prices in shillings and pence. Reproduced courtesy of Sam Seaman. 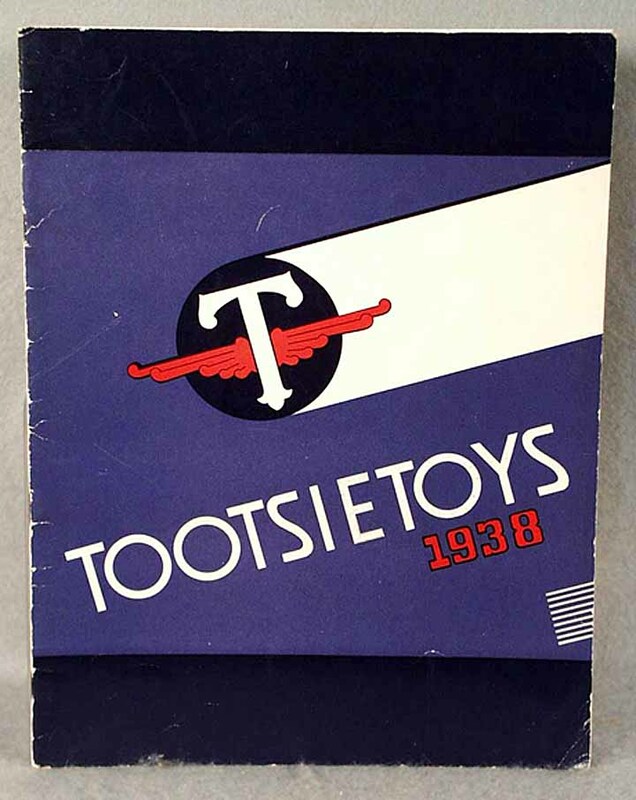 In March 1938 in the trade magazine Playthings, Tootsietoy announced "A nationally famous artist has designed new packages for the entire Tootsietoy line!" 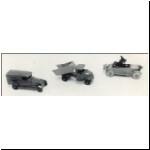 1938 saw the addition of two models: the large wrecker in the "Torpedo" series (see part 6) and a rather nicely cast "US Army" armoured car. 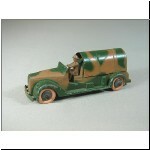 The latter had Graham-type wheels with white tyres and a metallic grey finish, later to come out in a more bronze-toned finish and then in khaki and camouflage versions. 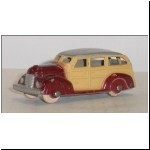 The wheels also went through the changes of other models during this period, emerging after the war a solid black rubber. 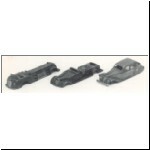 There were rather brittle swivelling guns mounted through key-holes in the rlght-hand windscreen and rear of the turret. Because of their fragility, few guns have survived intact. 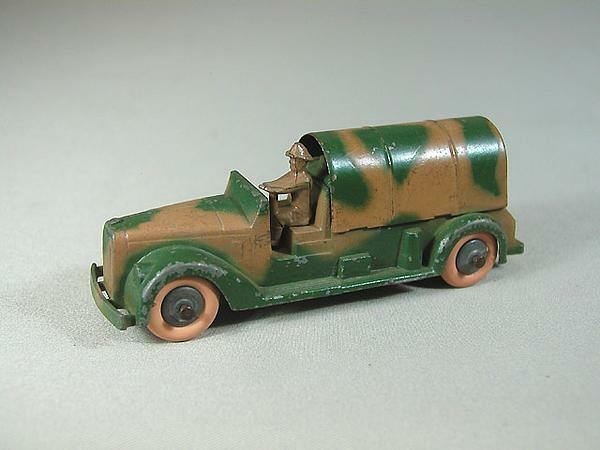 In 1939, besides the modifications to the fire trucks noted last month, the insurance patrol casting was also converted to the "Army Supply Truck" by covering the rear with a tin "hoop and canvas" top and spraying the whole rig, including the fireman-driver, with khaki paint. 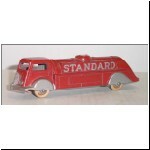 The year also saw the addition of a set of four snub-nosed fuel tankers with rather squared-off lines and with the names of well-known brands cast in the sides: Shell, Sinclair, Standard and Texaco. 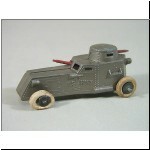 These, too, reappeared briefly after the war. 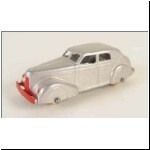 1940 was marked by the introduction of a new series of small 5c items to replace the 1935 Fords, of which only the wrecker continued to be available individually. 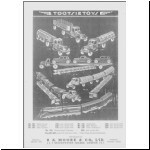 The series was given catalogue numbers 230-239, and is thus often called the 230 series, and was the first such group to have the numbers cast into labelling underneath. 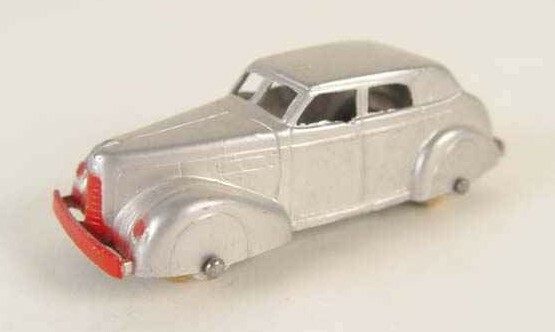 These were loosely modelled after contemporary cars, and some scholars of the hobby are diligently trying to match them up with actual cars of the day. I presume these researchers will report their conclusions independently when their labours are complete. 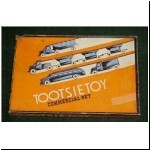 Suffice it to say here that they were not identified by the company. 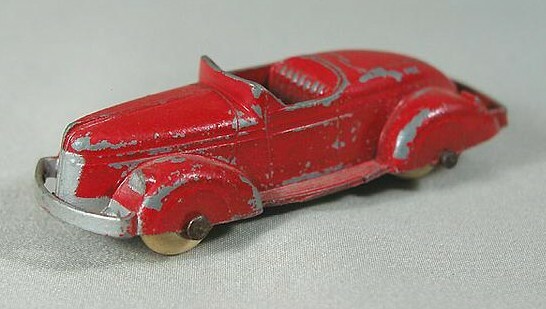 The sedan (no.230) is sometimes referred to as a LaSalle, leading to mammoth misunderstandings amongst some swapping correspondents. 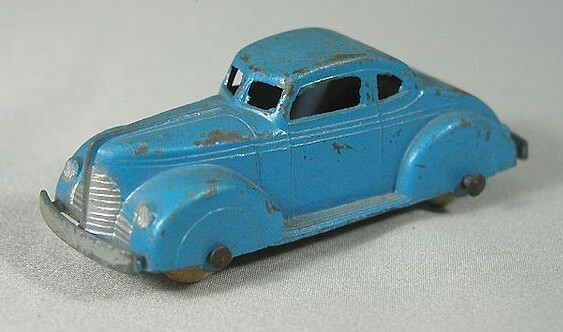 The other members of the group were a coupe, open touring car (first in the line since the 1915 Ford! 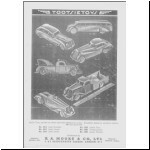 ), boat-tailed roadster, box van, oil tank truck, hook and ladder, insurance patrol, hose wagon with water gun, and station wagon (estate car) in the numbered sequence from 231 through 239. 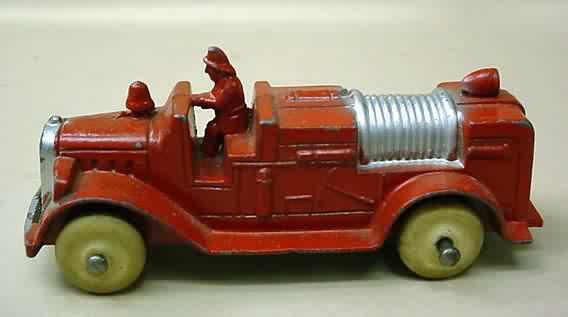 Here is the Fire Department Set no.184, produced 1940-1, containing the three fire trucks nos.236, 237 and 238, plus no.120 tanker. 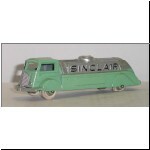 Two items in the range were also issued in a larger 1/43-ish size: the station wagon (no.1046) and box van with or without "Wrigley" advertisements on the sides (no.1010). 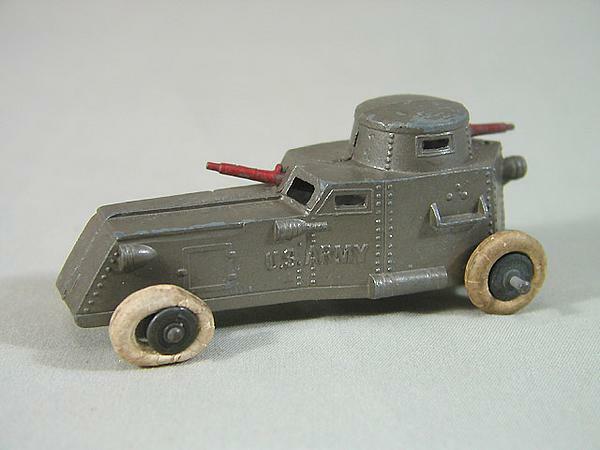 AIl of these were reissued after the war with black rubber tyres. 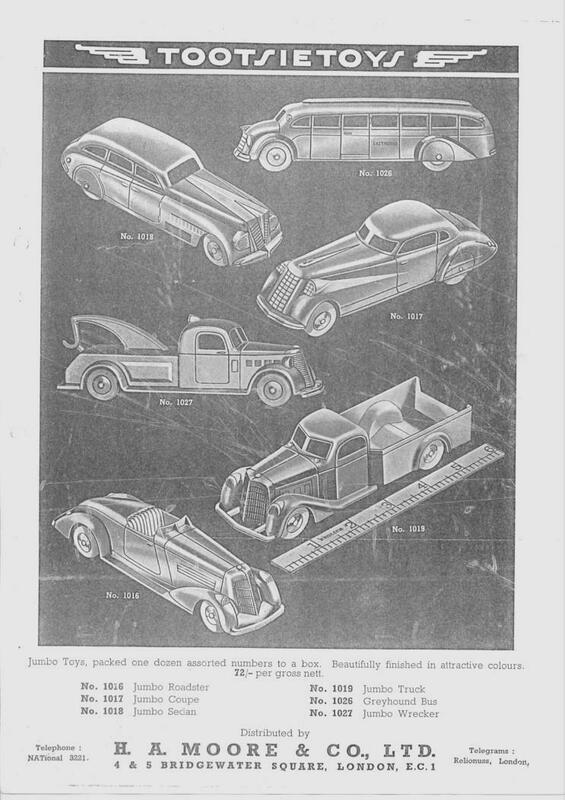 Innovations in the 1941 catalogue included the uptilted car carrier, a very rare item today, already discussed earlier in this series of articles (part 5). 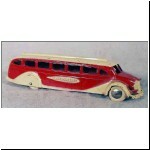 Also shown in this catalogue are boxed sets which included modified versions of the 1937 Greyhound bus. 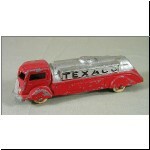 One version had TRANS-AMERICA cast into the sides, painted red and silver, red and cream, or all-silver, a very rare piece. 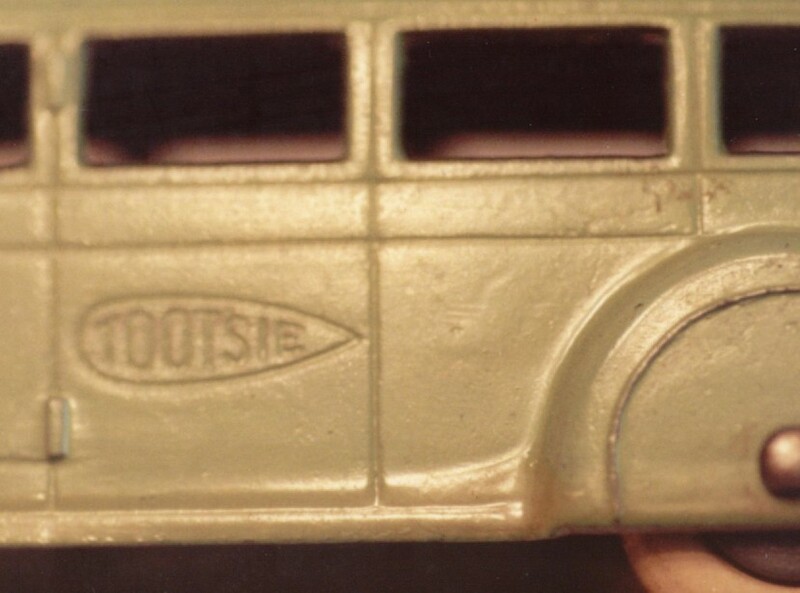 Even rarer is the silver (also red, light blue or green) bus marked TOOTSIE on the sides (according to Carl Natter this was shown in the 1937 and 1938 catalogues) . 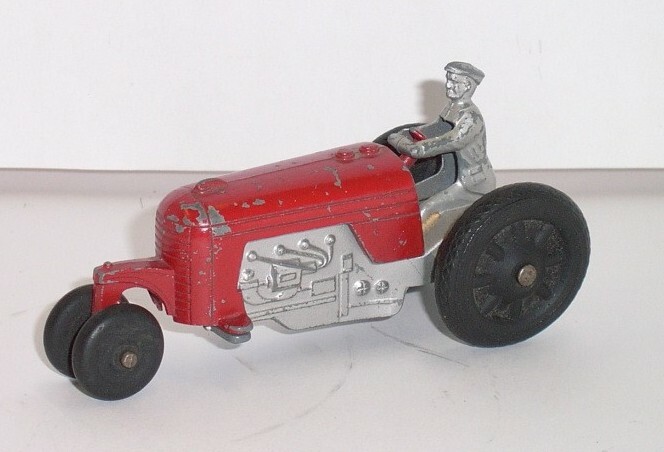 A new farm tractor was also shown, and is so rare that it may just be non-existent. 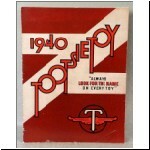 It is now known that this was issued (no.1011) (ref.10). 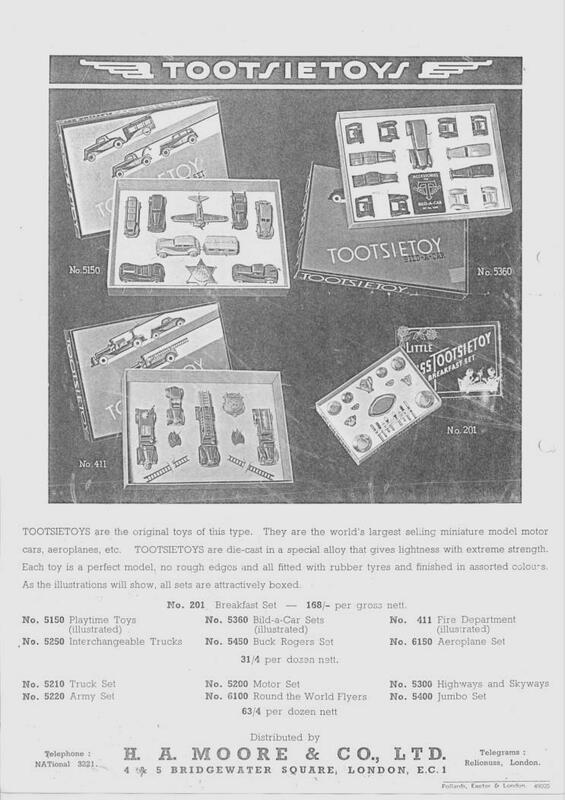 Four other new introductions in the 1941 catalogue were definitely never made: "Giant" Tootsietoys, they were expected to retail for 25c. 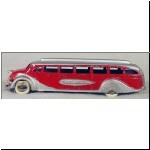 There were two Paramount-type Air-N-Lite taxicabs, a sort of modern landau in common jitney service in New York City at the time. One was in Yellow Cab Co. livery and the other in Checker Cab livery. (These are the names of common taxicab operating firms in many US cities, and are not to be confused with the manufacturing companies: Yellow Cabs and Yellow Coach Co. were a division of General Motors Corporation, and the Checker Co. is still in business making taxicabs which are also available in mufti). 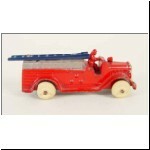 The other two items were to be a fire engine pumper and hook and ladder, both 7¼ inches long. 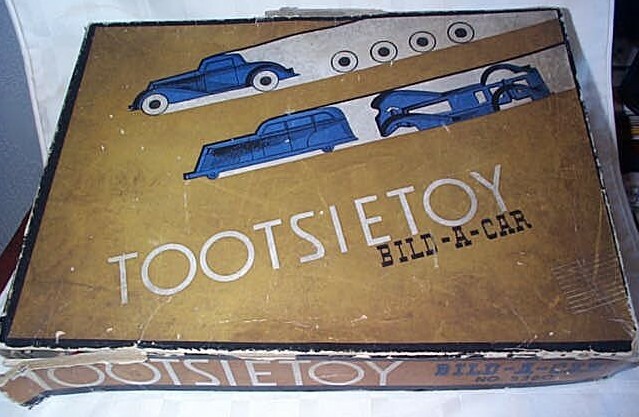 None of these ever reached production, and even the handmade prototypes were never completed. 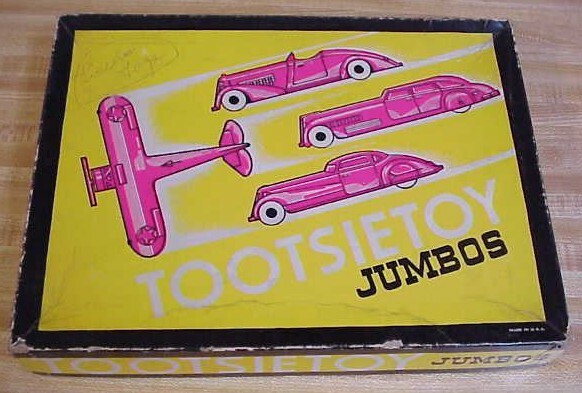 Thus endeth the pre-war sequence of automotive Tootsietoys. 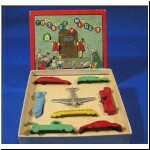 Omitted are trains, aeroplanes, ships, rocket-ships, doll furniture, and many other toys, favours, charms, miniatures, games and what-not. One has to draw the line somewhere, and I'm straddled on a series called the "Midget Assortment" no.610. 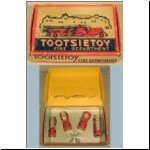 These are about 1½ inches long. 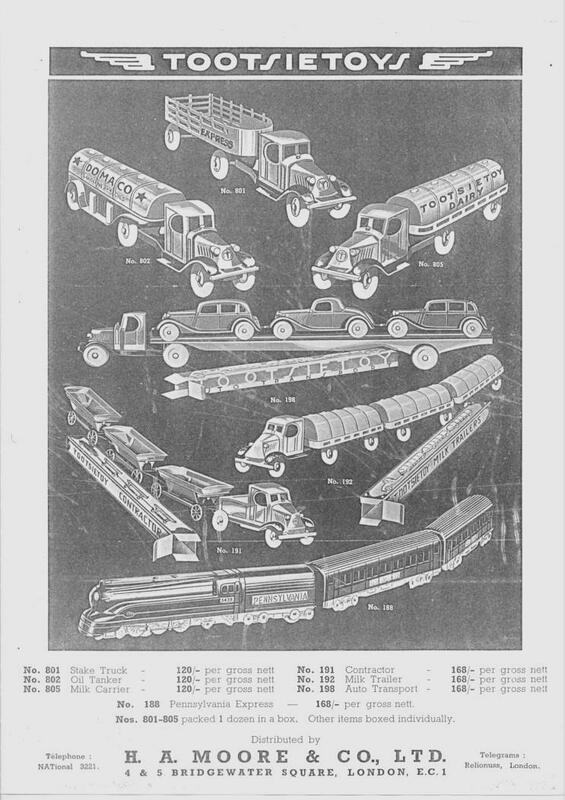 Of the dozen items, seven are road vehicles and one is a railcar. 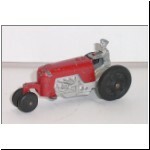 These are one-piece with integrally cast wheels and border on Cracker-Jack prizes. 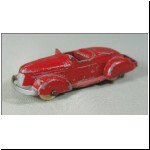 Still smaller versions were made as charms and party favours. Even so, a broad spectrum of scales was made. 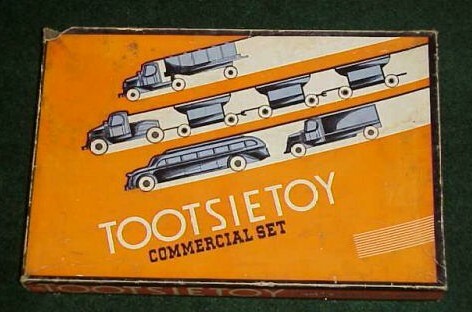 The set illustrated here is a slightly different Midgets set from the one that Clint described. 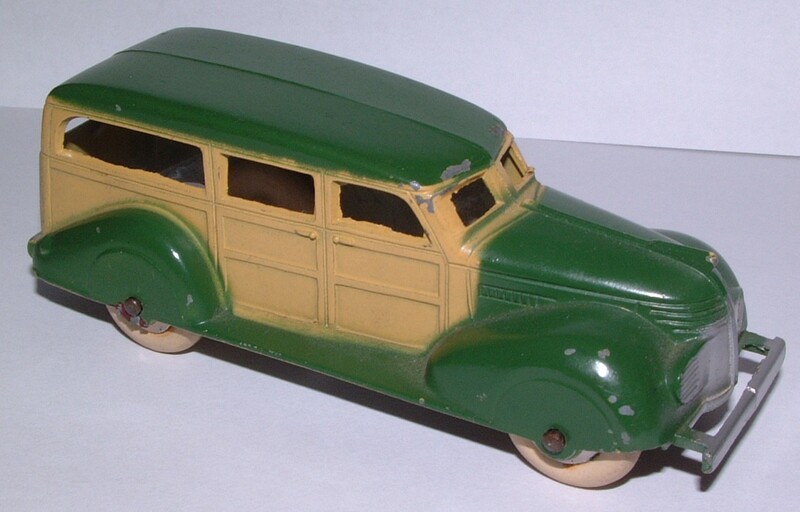 Some collectors have objected that the table at the end of this article omits the rear-engined Greyhound, the Scenicruiser, Classic Series, 1941 Buicks and others. 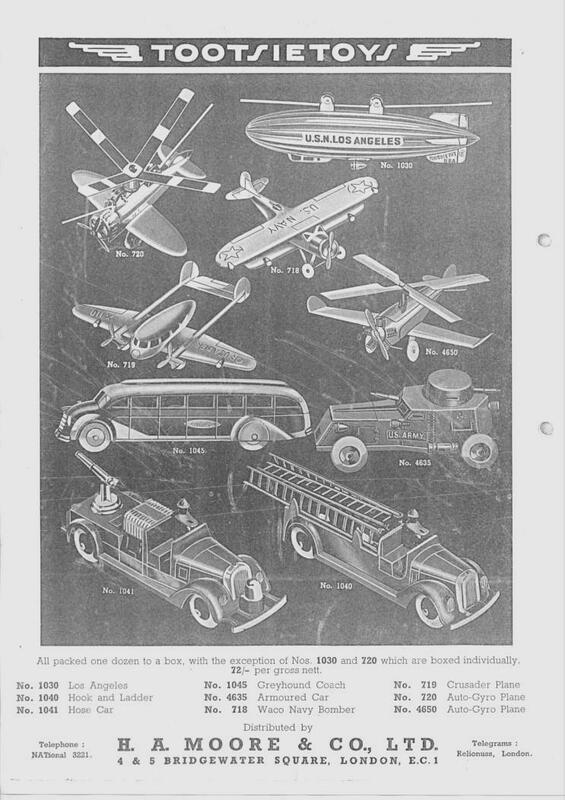 These all are post-1941, and out of this compendium. 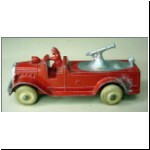 I notice that there is one remaining photo taken at the factory. Shown are three models that do not belong to the tables, but explain the source of their having been in earlier copies of the tables that I circulated to many of you. 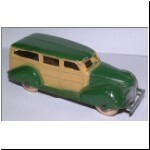 On the left is a GM Buick "US MAIL AIRMAIL SERVICE" van. 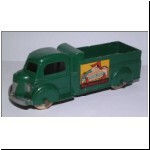 In the centre is a first series Mack dump truck with simulated wood-plank rear body. 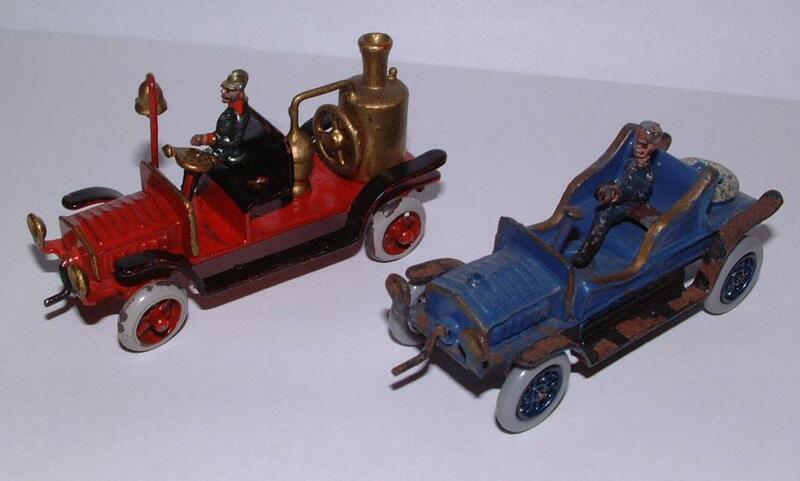 On the right is a Halloween witch driving a modified version of Uncle Walt Wallet's Funnies Series roadster. 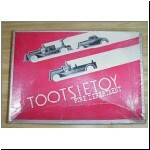 I had seen the first two behind glass at the factory, and circulated word of their existence. I have since been able to examine them more closely, to discover that they are hand-made "chopped" modifications, never put into production. 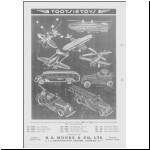 At the time of this more detailed examination, I also discovered that the company's Model A Ford Mail Van is also a "chopped" sedan! 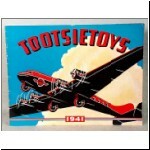 The Dowst Co. brought many "firsts" to the early history of our hobby. 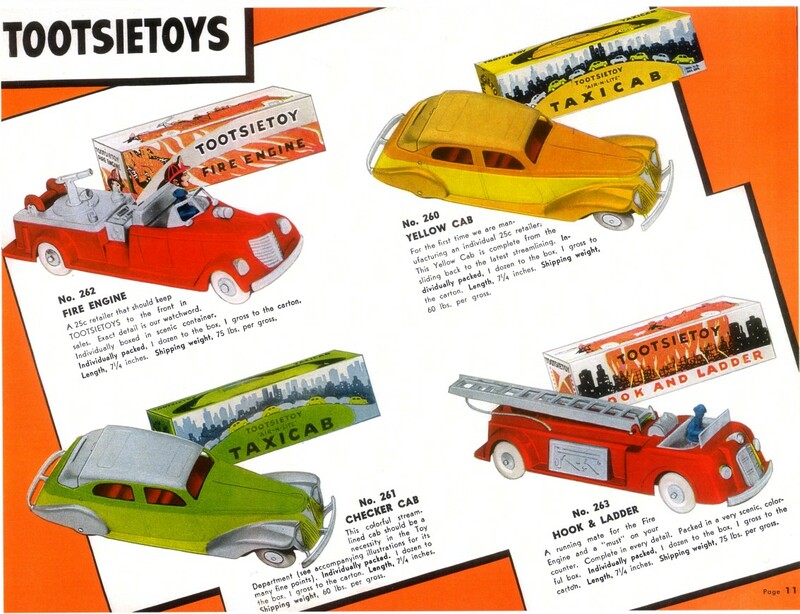 These firsts included many non-automotive and technical engineering considerations, but those of interest here seem to include the first die-cast toy car (1911). 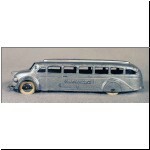 This tiny limousine was a full three-dimensional model, unlike several small bas-relief charms, pins and cuff links (and a small three-dimensional one-piece charm) made by Dowst during the first few years of the century. 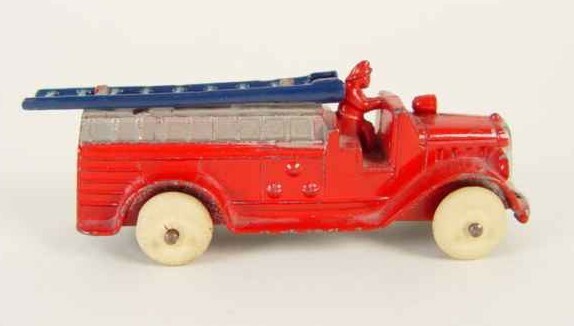 lt had free-turning spoked wheels. 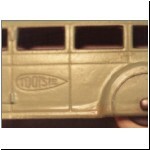 We now know that probably Clint was incorrect and the French were making die-cast toy cars before Dowst (see part 1 of this article). S.R. 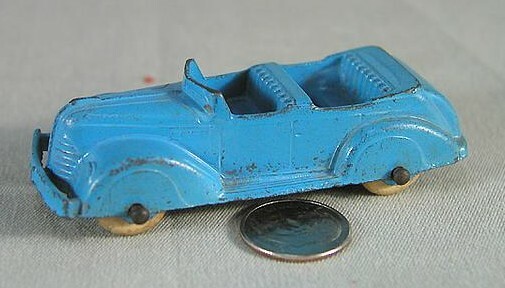 of Paris had a range of die-cast miniature vehicles available in 1912 (ref.4), and they probably pre-dated Tootsietoy's first automotive miniature of 1911. 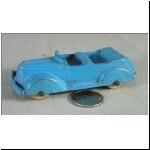 However, Dowst were first with a die-cast toy car in the enduringly popular three inch size. 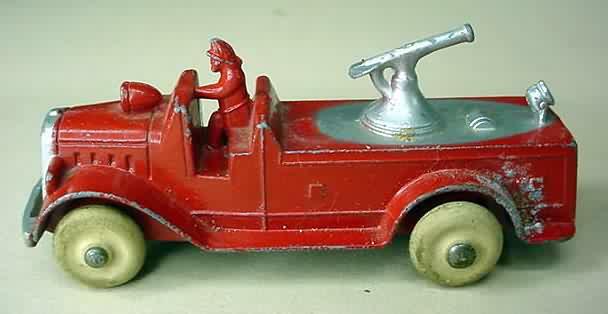 The 1915 Model T Ford carried the first separate windscreen/steering wheel casting. 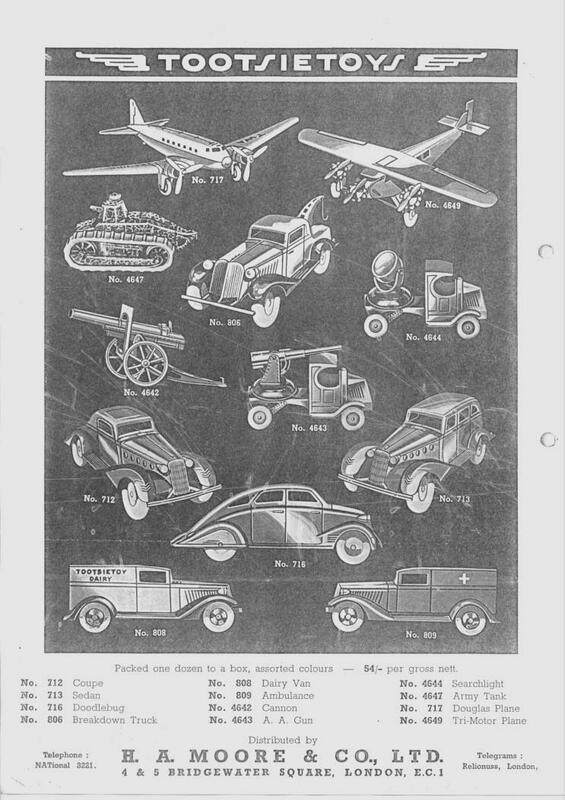 Other Dowst's firsts seem to include a detailed engine (1927), separate plated radiator (1928) and relief wire-spoked wheels (1928), a few years before slush-moulded cars began to sport them and nearly thirty years before Crescent models made this breakthrough in England. 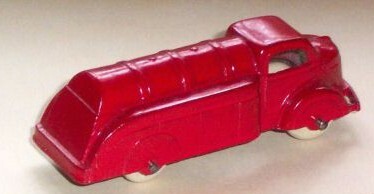 Other early introductions may or may not have preceded certain early models attributed to Ernst Plank and Marklin (and l'm thinking of early edwardian era items, not the later catalogued 1930 items coveted by us all): multiple body parts (though Dowsts were patented as the first to combine different coloured parts), separate removable driver and a fitted spare tyre. 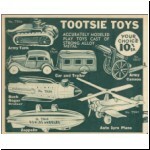 The illustration shows some of the Plank items that Clint was thinking of. 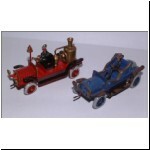 Although they look very edwardian, I have no evidence that they were produced earlier than the 1920s. 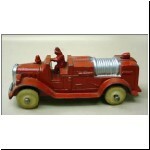 A substantial range of these models is shown in the Plank catalogue of 1925, reproduced in ref.13. 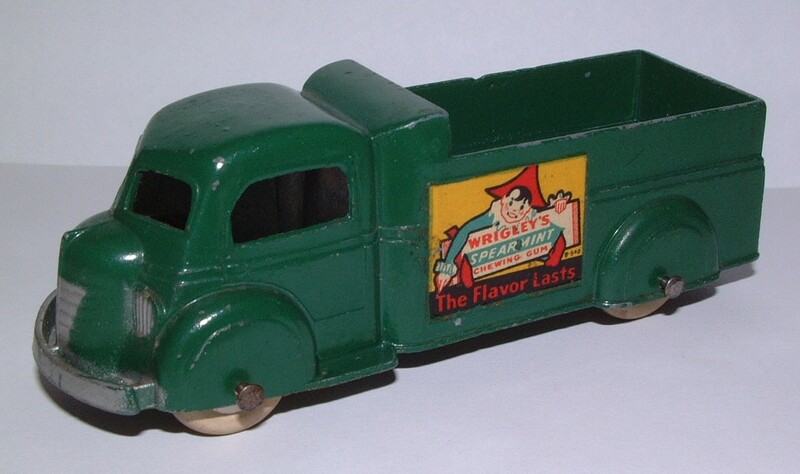 I am not aware of any Marklin cast metal vehicles before their 1930s die-casts. 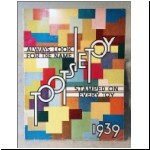 Another breakthrough died aborning, having been conceived and developed enough to appear in the 1925 catalogue. 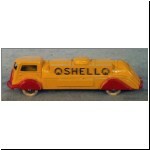 Some sort of snag (no one can recall just what) kept it from reaching production: the 1925 closed tourer was described as having a separate cast detailed interior of a contrasting colour. l have never seen one with it; have you? I am surprised that Clint did not mention another "first" which to my mind was just as important as the foregoing. 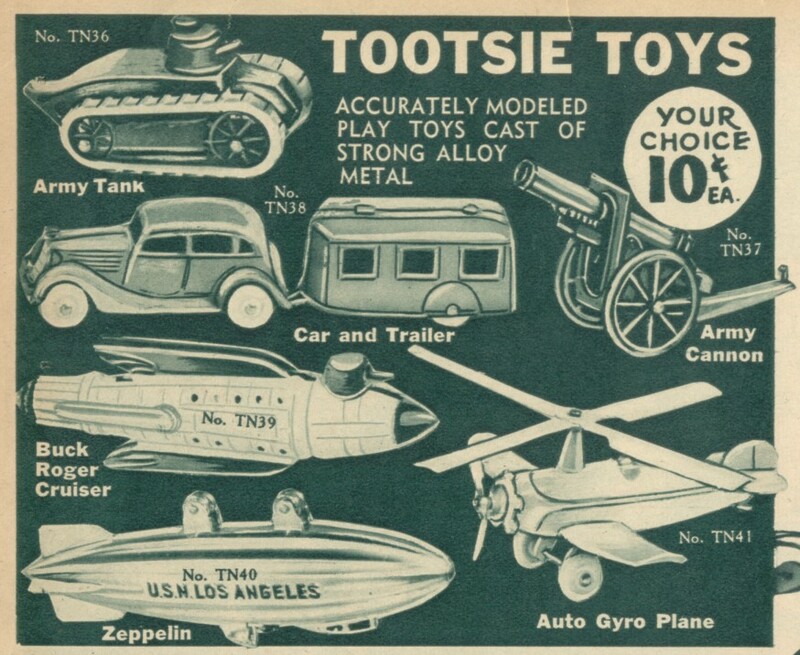 This was the introduction of zinc alloy in place of lead, one of the great innovations of 1933, which sooner or later was adopted by most of Tootsietoy's competitors. 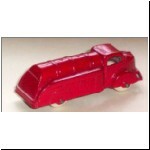 Those who didn't do so chose instead to leave the business of toy car manufacture. 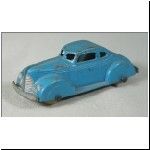 To this day, despite plastic parts, the zinc cast bodyshell is the hallmark of mass-production toy and model cars because of its strength and the detail that can be achieved. 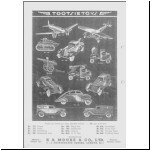 I had also thought that Tootsietoy were the first to introduce rubber tyres on a small size toy car, but according to Louis Hertz (page 197 in ref.5) this honour went to Kilgore on a series of cast iron vehicles introduced in 1932. 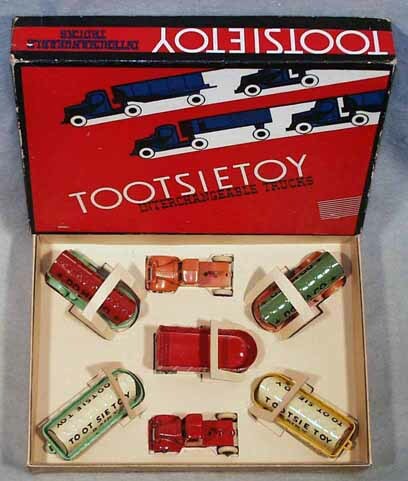 Tootsietoy responded the following year, and were certainly responsible for spreading the rubber tyre craze to Europe, where Tootsies were already exported in considerable numbers. 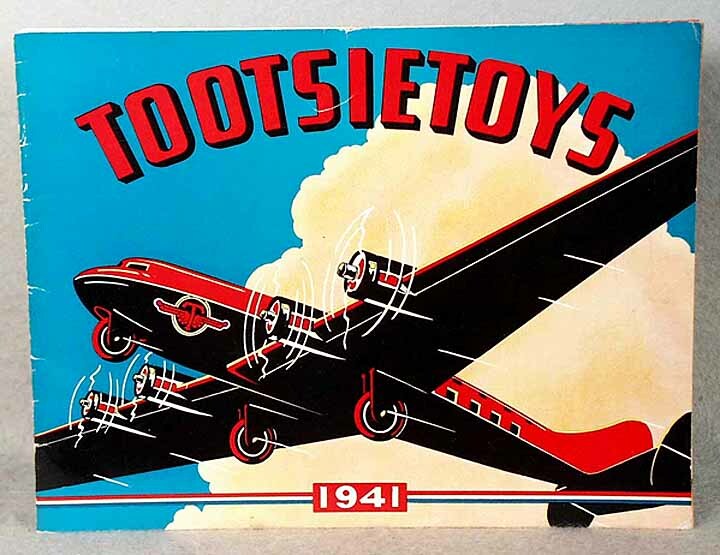 The Great Depression, when labour was cheap, materials plentiful and consumers happy to buy a 10c toy, was the zenith of Tootsietoy's business success. The war, which revived many other businesses, pinched them badly with material shortages, scarce labour, and an austere regard for toys. 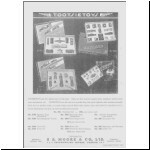 The post-war prosperity brought on high labour costs which made the production of complicated dies and multiple-part assembly prohibitively expensive. 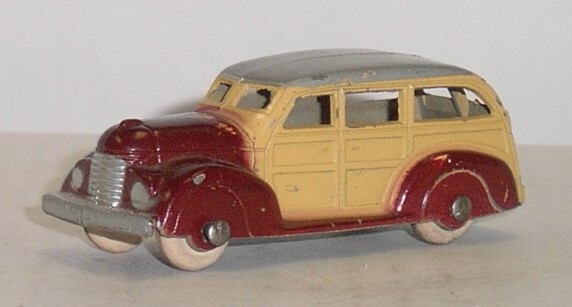 A newly-tooled LaSalle would prove much too costly to compete in today's market of toys, and lacking the multiple parts, interior detail, etc., of the higher priced, non-toy scale models being made in Europe. Such a production here would require a retail price far out of line with marketing reality. 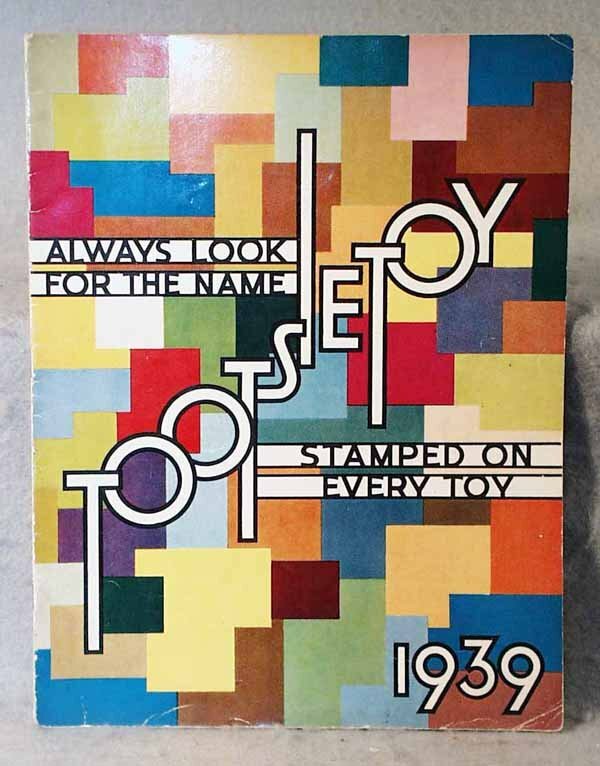 But surely, the price would not be remotely related to the boggling sums which have changed hands for one of the originals from 1935. 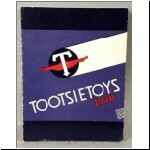 I tend to disgree with Clint's argument that the war was the start of Tootsietoy's decline - the seeds of their undoing were already planted in the late 1930s. 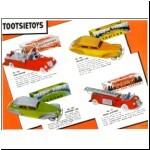 Contrast the Tootsietoy 230 series with Dinky's 38 and 39 series of cars introduced in 1939/40. 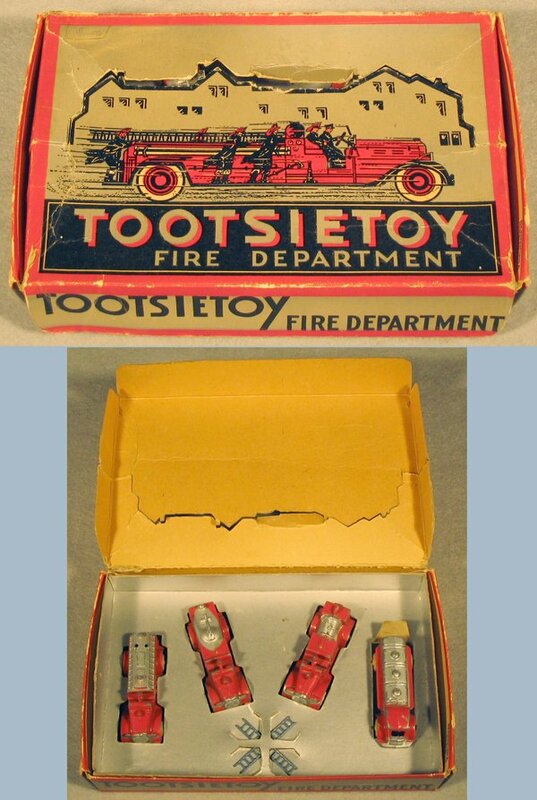 The Dinky Toys are delightfully detailed, accurate models of real cars, yet still made and sold as toys, whereas the Tootsies are generic blobs without even the sophistication of open wheel arches. 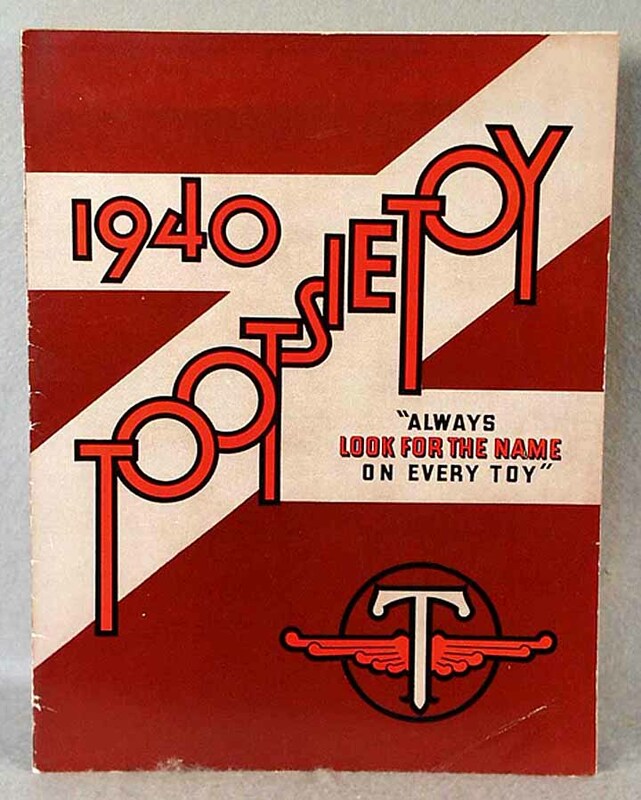 Tootsietoy had deliberately taken the course of making simpler toys, more suited for younger children, and thereby lost their appeal to school-age children and adults. 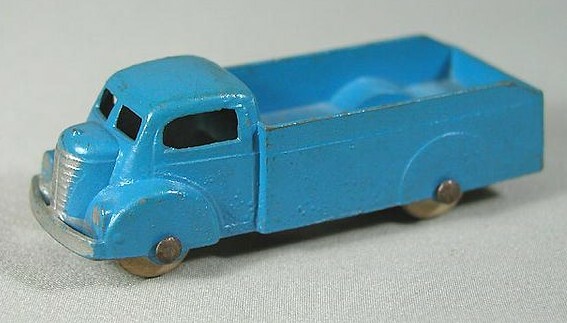 The gap in the market was taken by European, especially British, manufacturers after the war, firstly by Dinky Toys, while in the 1960s it was Matchbox and Corgi who led the world in toy and model cars. 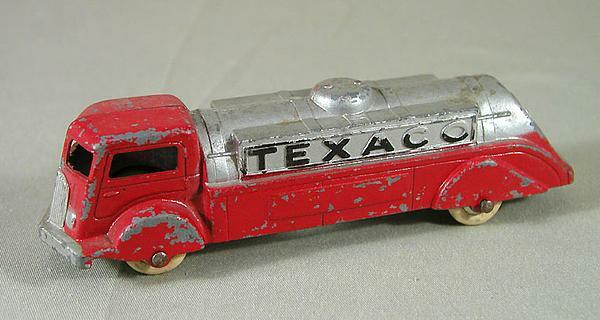 Bringing the story up to date, the toy cars of the 1980s and '90s were somewhat uninspiring, but recent production from China is attracting a new generation of collectors. 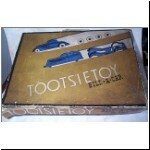 Delightful toys such as those pictured here (made by Yatming and Hongwell) are today's successors to Tootsietoys. 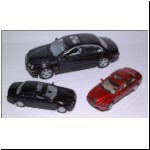 They are made of die-cast metal, cheap enough to be sold as toys but superbly detailed to appeal as models as well. 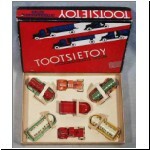 And if they are anything like Tootsietoys, they will still be collected in 70 years time! Next month, on to the tables. & Dieter Haas, Verlag Eisenbag, Switzerland, 1974.